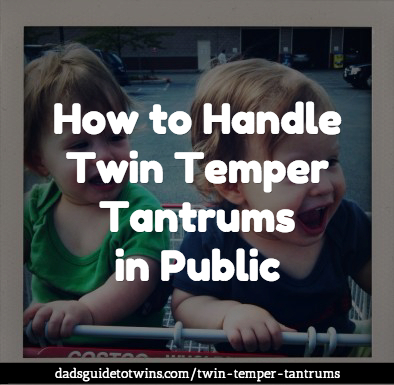 I want to give you a few things to consider in handling twin temper tantrums in public. 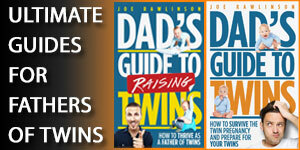 Now, the first priority, of course, as a parent is you want your twins to stop the meltdown. Try to keep this in perspective because the parents around you will fully understand what’s going on. They’ll know that it’s not necessarily your fault. They’ll know that your kids are having a temper tantrum, and as parents we’ve all been there before. You may get some sympathetic looks or comments. But then there’ll be complete strangers around you also that don’t have kids, or it’s been so long since they had kids that they don’t remember this phase, and they may look at you with disdain. You may also be concerned for the safety of your kids in the store. So your first priority is to stop the meltdown. Now one way to do this is to redirect behavior, so you may distract them with something you brought along with them to the store: a toy, a snack, or an alternative activity that they can play. Just like with stopping whining, redirection works in getting kids away from the meltdown and temper tantrum to something that you want them to do, but not always. Another thing that you can do is reinforce the good behavior that you want to see happen. 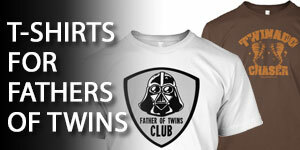 Even if both twins are having a meltdown in the store, one of them is likely behaving better than the other. 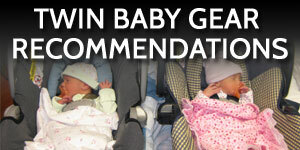 Focus on the good behavior and praise and encourage that and you may see a quick turnaround in both twins. Sometimes positive reinforcement or redirection doesn’t work, and that’s when you need to make your exit. Sometimes it’s okay to abandon the purpose of your visit to the store and walk out of the store with your screaming kids. Sometimes that’s the best thing that you can do. You may just need to sit with them in the car for a little while while they calm down, and then you can go back in the store and finish your business. Or things may be so bad that you just need to give up and go home. That has happened to us. That’s happened to many parents like yourself. So don’t feel completely defeated or feel like a horrible parent if this were to happen. Sometimes exit is your best option. Once your kids are home, they’re calm, and the incident has passed, you need to reinforce the behavior that you do want to see again. The older your kids get, the easier it is for you to carry on a rational conversation with them about past behavior, so you can talk about what happened, what went well, and what did not go well. You can set expectations of the behavior that needs to happen the next time. 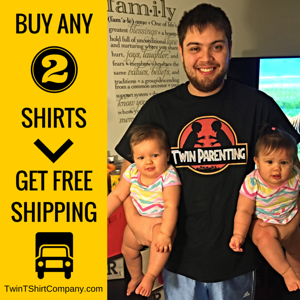 So when your twins have a total meltdown in the store, try to stop the behavior, redirect it, reinforce the good that you do see, and if all else fails, abandon the store and exit with your twins so that they can calm down. Afterwards, make sure you reinforce the behavior that you’d like to see next time. 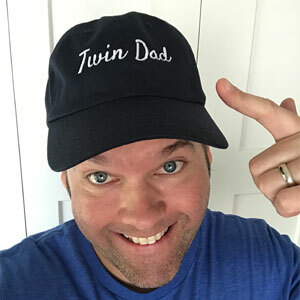 I do talk more about the challenges of going out with your twins to stores and in public in chapter nine of my book, Dad’s Guide to Raising Twins: How to Thrive as a Father of Twins. @Martyn – I love the escape route too although it does wreak havoc on your errands if you couldn’t complete your tasks when you have to leave.